An early start this morning for Claire & Mike’s wedding at the amazing Watergate Bay Hotel in Cornwall. 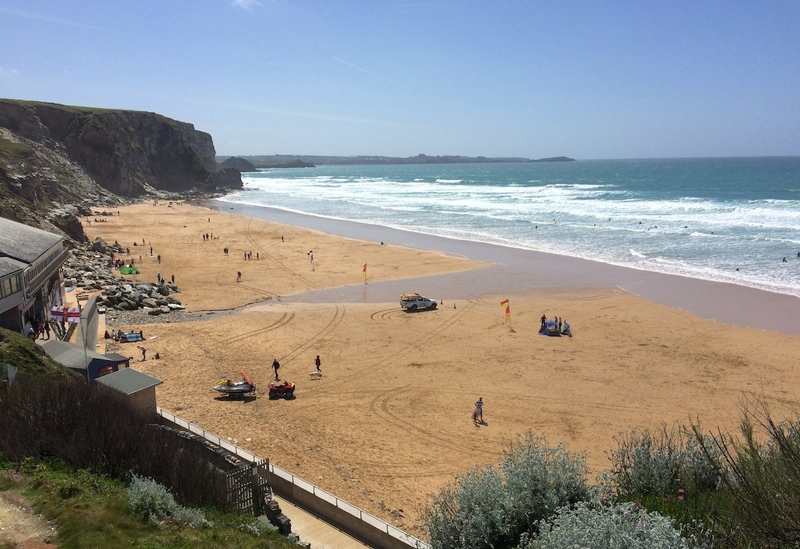 Just North of Newquay, Watergate Bay is a new destination for me, and I’m so glad I got to play at this incredible venue! 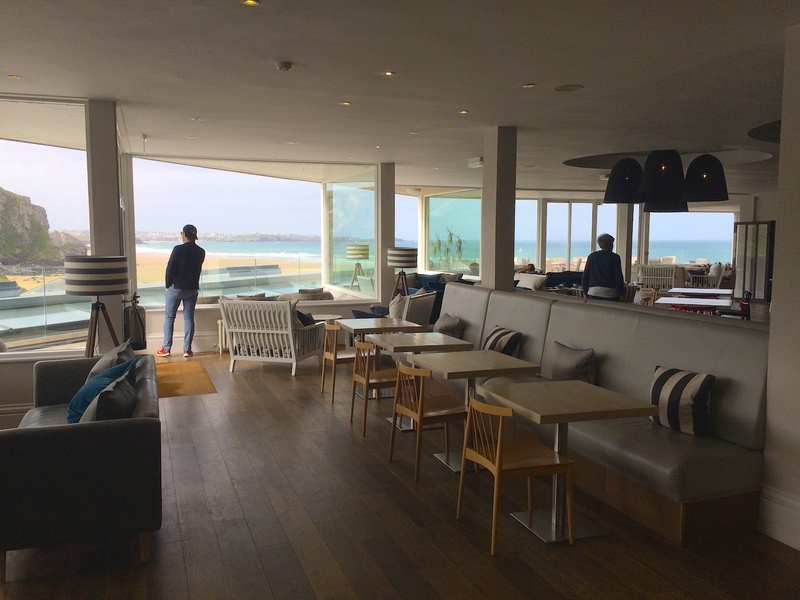 The views as you walk into the hotel restaurant are just breathtaking – the restaurant looks out over the beautiful sandy beach, and fortunately we had a lovely sunny day. I set off just after 7am this morning and made it to the venue before 10am – plenty of time to get set up and ready for Claire & Mike’s 1pm ceremony. The events space is small, intimate and beautiful – and the styling looked fantastic for the ceremony. There was around 60 guests at the ceremony, which apparently is one of the larger weddings hosted at this venue. Guests started to filter in at about 12.30pm, at which point I began playing some acoustic songs. Claire & Mike selected today’s playlist (see set list below) with some lovely choices, from The Beatles right through to Kodaline. The bride entered the ceremony to the traditional wedding march “Here Comes The Bride”, played on acoustic guitar. For the signing of the register they chose “Can’t Help Falling In Love” by Elvis and “Only Love” by Ben Howard – and they exited the ceremony to rapturous applause as I played “All You Need Is Love” by The Beatles. 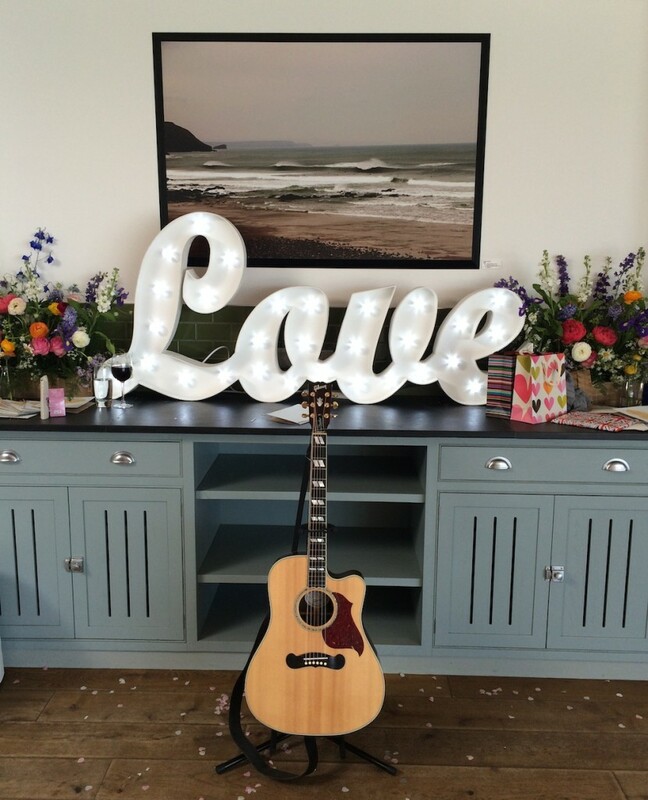 Love is… an acoustic guitar! Canapés were served and guests had an afternoon drink while I played some acoustic tunes at the drinks reception. I had an absolutely fantastic day – I’d like to extend my congratulations to Claire & Mike and thank them for inviting me to play on their big day! Hope the evening was just as fantastic as the daytime… I wonder if anyone got carried away and decided to go for a swim!! 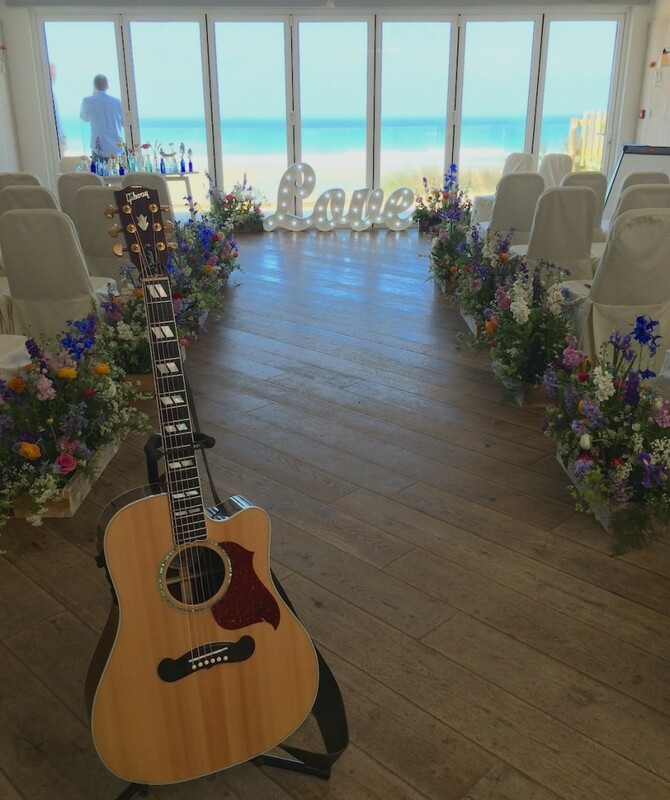 The Bridal March "Here Comes The Bride"
This entry was posted in News, Wedding Guitarist Blog and tagged acoustic, appearance, appearances, Beach, Bristol, ceremony, Cornwall, entertainment, event, guitar, guitarist, idea, ideas, inspiration, live, live music, music, musician, Newquay, performance, reception, Seaside, set, singer, singing, venue, venues, Watergate Bay, wedding, weddings by Pat McIntyre. Bookmark the permalink.